Oh, if those 1800-era temperance settlers only knew what’s been happening in Lompoc over the past 20 years, they’d probably turn over in their graves! The town of Lompoc, California was founded in 1874 as a temperance colony, but, try as they would, the bevy of ax-wielding women couldn’t hold off the demon alcohol for long: by the time the town was incorporated in 1888, the ban against the sale of liquor was overturned. And now the hills leading to Lompoc are bedecked with grapevines, whose tendrils and leaves glisten in the afternoon breeze that waft in from the nearby ocean. Beginning in the late 1960s, I often traveled Highway 101. Just north of Santa Barbara, turnoffs marked “Lompoc” made me curious about just what lied beyond those rolling hills, but not quite curious enough to make that 20 or 30 mile drive. Instead, I would inevitably head east to the Danish village of Solvang for shopping and Pea Soup Anderson’s in Buellton for lunch. In more recent years, I noticed those California hills becoming increasingly verdant with vineyards that replaced former sagebrush. And so it was with anticipation that I attended a press trip in April hosted by “Explore Lompoc,” the visitor outreach of the Lompoc Business Improvement District. I discovered a city of 44,200, with a bustling historic downtown, friendly merchants filled with community pride, and a major military installation, Vandenberg Air Force Base, just north of town. Sound familiar? Today Lompoc is the perfect hub to discover art and antiques and go wine tasting, with some excellent restaurants and affordably priced lodging. I stayed at the Embassy Suites, and enjoyed a full breakfast each morning. Be sure to place La Botte Italian restaurant at the top of your dining list. Owners Nick and Caterina Agate, natives of Marsala, Italy, migrated to America in 1969 and to Lompoc in 1981. This warm and welcoming couple have been dishing up fabulous authentic Italian cuisine in town ever since. Although vines were planted as early as 1971, it wasn’t until 2001 that the Sta. 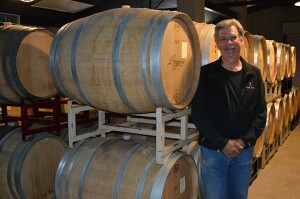 Rita Hills Winegrowers Alliance was granted AVA (American Viticultural Area) status. 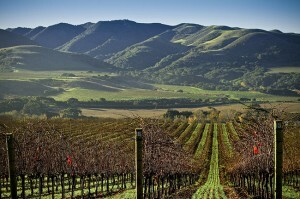 (It was first known as Santa Rita Hills, but was renamed to differentiate it from the Santa Rita appellation in Chile.) Today, the AVA, one of the smallest in California, is home to 60 vineyards, with 1,700 of its 30,000-plus acres under cultivation with plantings of pinot noir, chardonnay and 18 other cool-climate wine grape varieties. The AVA roughly occupies the area between the Santa Rosa Hills and Purisima Hills, just went of Buellton, extending to Lompoc’s eastern fringe. It’s one of the world’s best cool-climate viticulture areas, benefiting from the marine-based soils with elevated calcium levels and the Pacific’s cooling influence through fog, wind and moderating summer heat. While you can visit a number of tasting rooms at these wineries, a good place to start is the Lompoc Wine Ghetto, a collection of 17 small wine-production and tasting rooms housed in an industrial park on the edge of downtown Lompoc. Outside, the steel-frame buildings aren’t fancy, but what’s really fun is discovering some of the fine wines (and often coolly designed interiors) inside the bays. Often the people behind the counters are the owners of the wineries. 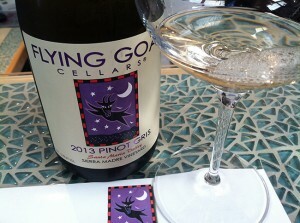 At Flying Goat Cellars, I met the husband-wife team of Norm Yost and Kate Griffith and their chocolate lab, Cooper, and tasted a number of superb pinot noirs. Richard Longoria was our host at his Longoria Winery, housed just across the street from the ghetto’s industrial sheds, in a 1913 farmhouse, which he restored in 2013. Longoria, who began planting in 1982 in Lompoc, was one of the pioneers who created the Sta. Rita Hills AVA. On the outskirts of Lompoc lies La Purisima Mission, home of the most extensively restored of the California missions. The nearly 2,000 acre state park is home to 25 miles of hiking trails and a visitor center with excellent displays of life surrounding the mission during the 1800s. The park frequently provides a re-creation of early California life, with weaving, pottery and candle making, blacksmithing, and leatherwork demonstrations. The day I visited, we enjoyed fresh homemade corn tortillas..
Lompoc is just nine miles from an important segment of the California Coast: Point Conception. The point forms a “corner” where north and south ocean currents collide — subsequently the site of many a shipwreck. There’s something about towns that are in their burgeoning stages that I find appealing. Like Coronado, Lompoc has had its challenges over the years. Coronado’s big challenge came in the 1980s, as the city grappled with changing habits of its residential population. Lompoc’s challenge came in the 1980s as well. In 1972, Vandenberg was designated the West Coast Space Shuttle port, but it was never used as such. Following the 1986 Challenger disaster, a chain of events led to the decision to cancel all West Coast shuttle launches and Vandenberg was officially terminated as a shuttle port in December 1989, yielding a substantial blow to Lompoc’s employment roles, and patronage of its downtown businesses. Lompoc rose to the challenge. Two residents, Gene and Judy Steves, visited the community of Chemainus on Vancouver Island in British Columbia. That town’s large sawmill closed in 1980, and its 3,500 residents used art in the form of large murals as a major economic rebuilding tool. 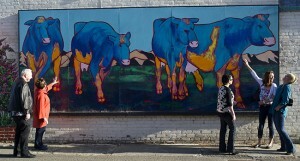 The Steves proposed that Lompoc do the same, and a nonprofit mural society, operating under the city’s umbrella, was formed. 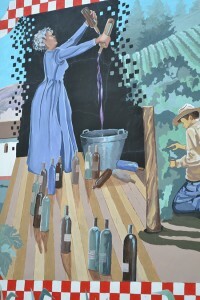 Lompoc’s first mural celebrating the flower industry was painted in 1990. 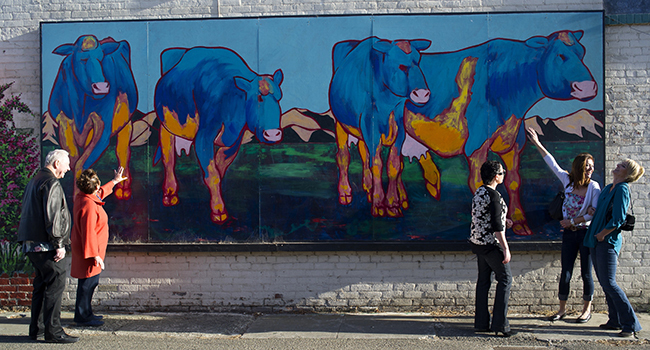 Today, more than 40 murals are installed in the city’s Old Town district and depict scenes of Lompoc’s heritage, flower industry, ethnic diversity, historic sights and scenic beauty. I took the train to Lompoc, enjoying a leisurely and scenic ride up the coast, particularly between Ventura and Santa Barbara, where I transferred to a bus for a 50-minute final leg to Lompoc. Round trip was less than $100; a fine way to unwind at such an affordable price. Want more ideas for a Lompoc getaway? Go to explorelompoc.com for all you need to know! 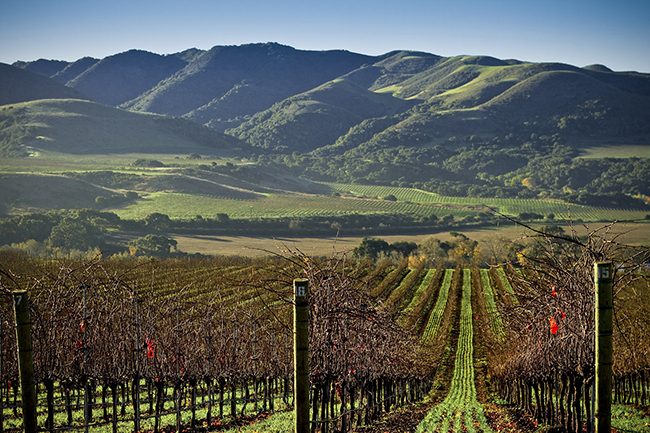 Lompoc’s hills are now dotted with vineyards. A segment of the “Lompoc Vintage” mural by artist Colleen Goodwin Chronister depicts the community’s early days as a temperance colony. Flying Goat Cellars is one of several wineries with tasting rooms at the Lompoc Wine Ghetto. Richard Longoria operates a winery in a century-old farmhouse.